NRM Primaries continues and it’s like a circus! You thought we through with the fun or madness called NRM Primaries? The Circus it has become if you follow Gen. Otafiire and his been played. Well, you played your cards wrong and didn’t due diligence where you have been representing ever since arriving in the Parliament in the 80s. So now change has come. There has come a lot of changes! I will just bring some reports from today. There will be more directly and also more vivid result on Daily Monitor, Chimpsreport, New Vision and other outlets, even NTV and NBS… I have a few from different sources. The greatest news today isn’t some victors, but the reports from Lira. I am proud of the people of Lira! You didn’t buy in the greed, but stand proud! You got integrity something that is more valued than some giving you shillings for a vote. That is great report. Take a look! “We do not control the register – it’s the Secretary General. There is a village that had only one registered voter”. “This has been the best ever elections by NRM. I don’t think there have been several cases. Those who have issues should petition” (…)”On a scale of 1 to 100, I believe we have scored 58%.” (…)”I will not resign. Resign for what? I cannot be pressured. These MPs and Ministers can’t scare me” (Ayiswa, 2015). Gen. Otafiire calls the NRM Primaries an actually a “Circus”; and feels his: “being played with”. “LIRA: Majority residents and leaders from Lango sub-region who were invited to attend a campaign rally to denounce vote-buying and selling during the forthcoming 2016 general elections did not turn up” (…)”A resident of Lira Town, Ms Margaret Obote, said it is not bad for voters to accept bribes so long as they vote wisely. Opposition candidates accuse the ruling party of encouraging vote-buying, Mr Odur said could well be true. He further said President Yoweri Museveni for years has been known for offering expensive gifts which to him (Mr Odur) look like vote-buying”(Oketch & Alaba, 2015). In Kampala as the NRM Primaries there been reports of angry crowds on the Buganda Road as the murder suspect Ssebuwufu was taken away in a minibus while they wishing him gone. A strange rumor that is going is that in certain areas that the NRM Register didn’t need to see member cards in certain district and let even FDC members was allowed to vote in this NRM Primaries. That is a shocker if that is true! Is that true, ladies and gentleman? Florence Nebanda of the Butalejja District claims the Primaries is a fraud and has filled in a petition to the NRM-EC where she is saying she is cheated! In Bbale Police Station the incumbent Sulaiman Madada got detained yesterday for attempting to run away with the declaration form. In Butembe County the pastor Nelson Lufafa is the flag-bearer now of the county. In Bukiwe County the gospel singer Judith Babirye won the seat in the area. In Buhuya County the Kabarole district Margaret Muhanga Mugsiha has won and become the flag-bearer with over 14,000 votes. In Ndorwa County West the former campaign manager Gilbert Agaba lost to David Bhati who now is the flag-bearer for the district now. In Kibale County the Pallisa Woman MP Judith Amoit Omagor lost her spot to former CMI spy Richard Oseku. Also in Pallisa County the incumbent Jacob Opolot lost his seat to Rogers Tatambuka. In Sserere the incumbent Joseph Opit Okojjo won the seat for LC5 NRM Flag-bearer with a massive amount of votes. “The Mbarara District Police Commander Jaffar Magyezi has arrested over 50 people in Mwizi Sub County, who allegedly attacked supporters and agents of opposite candidates in the build up to yesterday’s NRM primaries” (…)”Police says that last Sunday, rogue supporters of Charles Ngabirano attacked and assaulted those of the reelected Rwampara MP Vincent Mujuni Kyamadidi and Mutima Gordon Kappa, accusing them of betrayal” (…)”The DPC says up to 50 suspects were arrested in a swoop, from which the ringleaders will be singled out and charged” (Nahamya, 2015). In Mawokota North Amalia Kyambadde won the district with 79%. “Jimmy Okema, spokesperson for Aswa region said on Wednesday morning that Inspector of Police Morris Latigo, attached to Aywe police post in Gulu municipality has already made a statement on pictures showing him in uniform voting in the NRM primaries at police primary school in Gulu town. The picture began doing the rounds online yesterday. Okema added that a disciplinary committee is already being instituted to listen to a case of misconduct against inspector Latigo” (Acholitimes, 2015). “We also sympathize those that have not yet held those elections including my own Kyaddondo County South Constituency/ Makindye Ssaabagabo Municipality in Wakiso District. On our part, there was an excuse of lack of enough ballot papers, which was later found lame as we had enough of them. The real reason was that my supporters had stormed polling stations as early as 6.00 am and it scared my opponents.l, and Municipality NRM Chairperson Godfrey Kiwanuka insisted that elections should go on yesterday but the Registrar Mr. Charles Settebere and Frank Kyazze, my opponent, insisted that we vote today. NRM Deputy Spokesperson also said that elections in Wakiso would go on today. Later, however, NRM electoral officials in Wakiso decreed that elections would be held tomorrow Thursday October 29th starting at 8.00 am and ending at 4.00 PM: Although some press reports today have said that elections in Wakiso would be held on Friday, 30 minutes ago, Makindye Ssabagabo Registrar has told me that he has got instructions from Wakiso to hold elections tomorrow. So, on behalf of NRM, l apologize for what we are going through in Makindye Ssabagabo and elsewhere, and call upon people to come in large numbers and participate in the elections. Even those without yellow cards but whose names are in yellow books, will vote. Let’s vote for a potential MP but not a mere flag bearer as it has been the case since 2006” (Musaazi, Ahmed, 2015). “Have been watching the NRM primary elections for Amuria closely with my net on standby for 2016, watch this space btn AJEGO VS AMERO match. Amuria needs leadership balance. this time. Nepepe I pedori oni, my ,6 sisters who couldn’t make it in primaries lets join hands than taking off to independent .. join Ajego task force Amuria 2016 we Share. the dream for our land” (Jackie Ajego, 2015). “It’s almost 24hrs since we lost to a thug. Honestly i want to thank all the people of Bugabula North constituency for the continued support you’ve given us since we began this process in February this year till this just concluded NRM primaries that were marred with irregularities, intimidation of our voters, bribery, beating/harming agents and voters plus all sorts of unusual character by our opponents. To our understanding, we won this election though the thugs used all possibilities to garner support from government police agents who even went to the extent of protecting a lone voter ”Mrs KIZIGE” to tick all the ballots alone at a polling station. It’s unfortunate u were denied chance to vote a leader/ candidate of your choice but trust us, we aren’t contented with this too. However, with great confidence and trust in you our supporters, we are considering your views to stand as an independent coz we shall not accept such rigging where by a candidates garners 650 votes at a polling station of 167 voters. That’s impunity. Let’s work together for the good of our next mission tha shall see us in parliament. United we stand, Divided we fall. God bless u all that” (Raymond Peter Taayle). “Kaberuka 1892 Dixon 137 Rugaju 431 Kyatuheire 272 Rubasha 169 Mbabazi Julius 169 Bakamungyema 77.Kasya 2425 Bakiiga 701Elizabeth 1088 Ruth 411 charity 181 Adah 735 Patience 205 Juliet 534n Nyakinon The sub-County registrar has been hijacked with one Caleb Karabareme and Hon. Jackline Kyatuheire in company of the RDC Harriet Nakamya 8:49 they have started pre-ticking and forcing refilling of the result forms” (Reported Earlier today!). The now former MP Dr. Peter Emmanuel Eriaku lost the election to Johnson Malinga is now the flag-bearer for the district. The ones who didn’t win the flag-bearer seat were Clive Solomon Ossiya and Patrick Aeku. The winner now the flag-bearer of the district is the Joseph Andrew Kuluo. The winner of the district is Adolf Mwesige wins with 20,314 over the Dr. Vincent Owujuni 12,987. The result from the district has made the incumbent MP Hon. Dr. Kamanda Batarigaya. The man who won the district is Richard Gafabusa who is the former speaker of Kusei (Parliament) and Obundigya Bwa Bwamba. The Woman MP of the District also lost her position and she is Harriet Ntabazi, the new winner of the Woman MP position Josephine Babugi. Also the Chairman of the LCV Jolly Tibemanya lost her seat to Ronald Mutegeki who was the former administrator of Bundibugyo hospital. Christopher Kibanzanga won with a margin of 5000 votes over Kiiza Acrobat. Elections stopped because candidate Diana Nuwanyine was not on ballot papers. Elections declared by Registrar George Katokozi. There been a lot and a lot of numbers. More will come and there will be more deep reports from the elections that have been marred with pre-ticket ballots, postponed balloting and lots of violence. 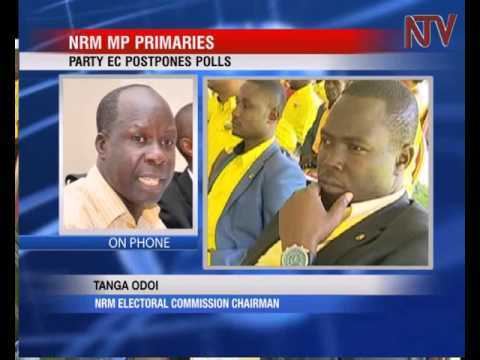 There have been areas of peaceful and righteous internal elections; maybe in the village with one voter, Dr. Tanga Odoi? No, I am joking but there is some sense that this internal election has been not smooth or swell at it should be. We all can agree on that after seeing the mess it has been. NRM EC can’t be proud of the result and how it been done. Secondly NRM CEC got to have a meeting in Entebbe and have some check and balances. Because there been enough issues and misgivings that there should be major clean-up and the results of losing members and other circumstances should show how the cookie crumbles! Peace.